The procedure of recognition of academic qualification for refugees without documentation implemented in the portal istruzionesenzaconfini.it is based on the following guidelines "Recognize qualifications held by refugees – guide for credential evaluators" delivered by the ENIC-NARIC Network (ENIC - European Network of Information Centers in the European Region; NARIC - NARIC: National Academic Recognition Information Centers in the European Union) available at the link: http://www.enic-naric.net/recognise-qualifications-held-by-refugees.aspx. ENIC-NARIC’s partner institutions are UNESCO, the European Commission and the Council of Europe. 1. Prepare a "Background paper"
2. Assess academic credentials based on the "background paper"
The evaluators will establish the outcome of the evaluation based on the purpose identified. The final outcome may be used for admission purposes to a new study cycle or to continue studies already started. 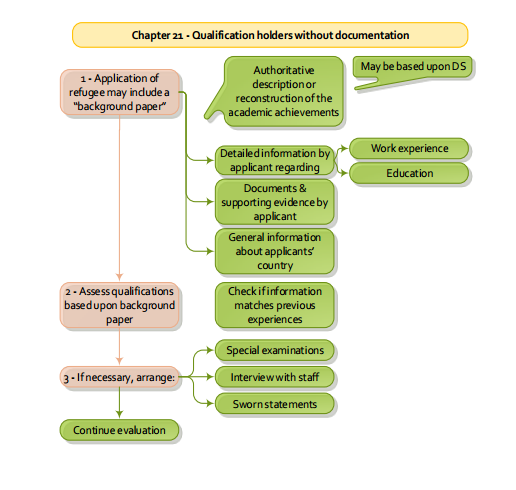 The process of recognition of academic qualifications for refugees without documentation implemented in: istruzionesenzaconfini.it complies with the indications of the European Recognition Manual for Higher Education 2016, developed by the EAR - European Area of Recognition project, and funded by the European Commission (The European Recognition Manual for Higher Education Institutions http://www.enic-naric.net/fileusers/European%20Recognition%20Manual%20Second%20Edition.pdf), supplying the standards and guide lines for the recognition of the university qualifications and careers in the European Union. Recognition of qualification holders without documentation - European guidelines for credential evaluators and admissions officers. EAR-HEI Consortium (2016). European Area of Recognition (EAR) Manual, chapter 12 and the new chapter 12 guide on access to higher education by applicants with inadequate documentation including refugees (link to chapter 12 coming soon). EAR Consortium (EP-Nuffic, UK NARIC, ENIC-NARIC France, and ENIC-NARIC Poland) (2012). European Area of Recognition for Higher Education Institutions (EAR-HEI) Manual, part V, item 21. EAR-HEI Consortium (EP-Nuffic, ENIC-NARIC France, ENIC-NARIC Latvia, ENIC-NARIC Ireland, European University Association (EUA), ENIC-NARIC Lithuania, ENIC-NARIC Denmark, ENIC-NARIC Poland and Tuning Educational Structures in Europe) (2014). Guidelines for the recognition of refugees' qualifications. ENIC-NARIC Networks (1999).